After five weeks of lazing on the beach and hanging out at the Skylark we have finally left Varkala. It was an odd feeling to think again about the best way to pack the bags. Travelling by train feels like we have returned to the real India. A man on the platform at Ernakulum Town approached and whispered “where are you going? Want tuk tuk?” assuming we did not know about the prepay booth in the station entrance. It feels good to return to somewhere where people remember you, it’s not quite home but almost feels that way. And home is where we are slowly but steadily heading. It’s now that we realise that we won’t see all those places we intended to visit before we left. No momos at the Tibetan kitchen. 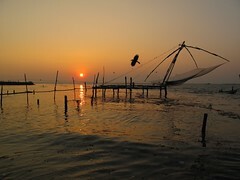 This entry was posted in India and tagged India, Kochi, Momento. Bookmark the permalink. Both comments and trackbacks are currently closed.